"How can Iran call for us to stop the fighting in Yemen? ... We came to Yemen to help the legitimate authority, and Iran is not in charge of Yemen," Saudi Foreign Minister Saud al-Faisal said Sunday at a joint press conference in Riyadh with his French counterpart, Laurent Fabius. Faisal called on Iran to stop providing political and military support to the Houthi rebels, a Shiite rebel group, that has taken control of swathes of the country, including the capital, Sanaa, in recent months. The US has meanwhile accused Iran of aiding the Houthis. For its part, Iran has denied backing the rebels. On Thursday, Iran’s Foreign Ministry summoned the Saudi charge d’affaires to lodge a complaint against allegations of Iran’s involvement in Yemen. Saturday Yemeni militiamen in Aden said they captured two Iranian military officers advising Houthi fighters. The two officers are allegedly members of an elite unit of Iran’s Revolutionary Guards. Tehran has denied these reports, according to Iranian state news agency IRNA. “Iran has no kind of military force in Yemen," Deputy Foreign Minister Hossein Amir Abdollahian was quoted as saying on Sunday. 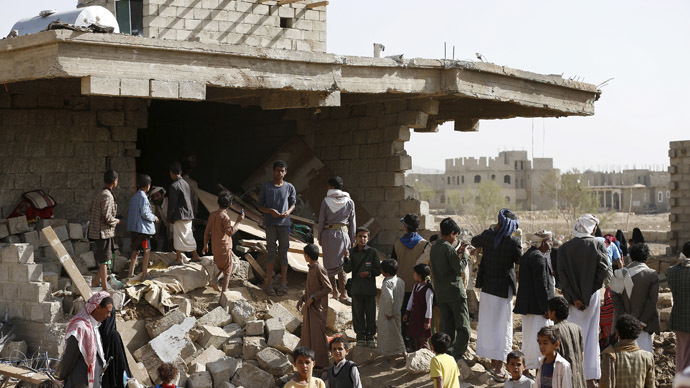 Saudi Arabia and nine other Sunni majority states began an airstrike campaign against Houthi positions throughout the country at the end of last month. Ousted Yemeni President Abd Rabbuh Mansur Hadi fled to Saudi Arabia as rebels advanced on Aden, where he had been staying since being forced out of Sanaa in February. According to the International Federation of the Red Cross, up to 1,042 people have died in the conflict so far. Even getting aid to conflict-torn areas and retrieving the dead has proven dangerous and outright impossible at times. “Our paramedics face being targeted while doing their job. There are dead and wounded left in the street whom we cannot reach," Abdullah Radman, a doctor with the International Committee of the Red Cross, told Reuters.